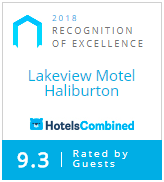 Lakeview Motel	Your home away from home, in the Haliburton Highlands of Ontario. It may only be mid Nov. but it is a winter wonderland here already. Winter events are starting so plan your excursion soon!